Why did Treasury Secretary Henry Morgenthau, Jr., who never wanted to raise Jewish concerns with President Franklin Roosevelt, reverse himself and ask FDR to help rescue Europe’s Jews in 1944? This intriguing historical mystery, cited in the January 16 installment of the PBS Television series “The Jewish Americans,” will be solved in a forthcoming book from Purdue University Press. 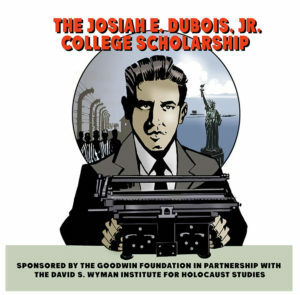 The book is Blowing the Whistle on Genocide: Josiah E. DuBois, Jr. and the Struggle for an American Response to the Holocaust, by Dr. Rafael Medoff, director of The David S. Wyman Institute for Holocaust Studies. The book will be published by Purdue this summer. The PBS series included a segment about American Jewry’s response to the Holocaust. It described how, until late 1943, Morgenthau “continued to go along with the president” on the U.S. policy of not trying to rescue Jewish refugees. It then showed Morgenthau family members saying they did not know what caused him to change his mind and finally ask FDR to rescue Jews. Blowing the Whistle on Genocide reveals that Josiah DuBois, a young attorney on Morgenthau’s staff, was the driving force behind Morgenthau’s dramatic change of heart. It was DuBois who, in mid-1943, discovered that the State Department was secretly suppressing news about Nazi massacres and obstructing opportunities to rescue refugees. Risking his career, DuBois blew the whistle on the State Department. He surreptitiously obtained damning documents and authored an explosive report exposing what State was doing. Blowing the Whistle on Genocide also reveals that DuBois told Morgenthau that if he did not bring the report to FDR, he –DuBois– would resign and call a press conference to reveal the State Department’s actions. Within days, Morgenthau met with FDR and presented the report. Under pressure from Morgenthau and Congress –which was poised to pass a Bergson Group-initiated resolution urging creation of a rescue agency– Roosevelt agreed to establish the War Refugee Board, which ultimately played a major role in rescuing an estimated 200,000 Jews from the Holocaust. The book is based on previously unpublished interviews with DuBois and other key figures in 1940s Washington, and rare archival documents. The book’s foreword was authored by Amb. Stuart E. Eizenstat, who served as U.S. Envoy on Holocaust-Era Issues and negotiated the agreements with Swiss banks and other institutions to pay reparations to Holocaust survivors. Blowing the Whistle on Genocide is part of Purdue University Press’s Shofar Monographs in Jewish Studies series, edited by Prof. Zev Garber. The publication of Blowing the Whistle on Genocide is made possible in part by the assistance of the Lucius N. Littauer Foundation.